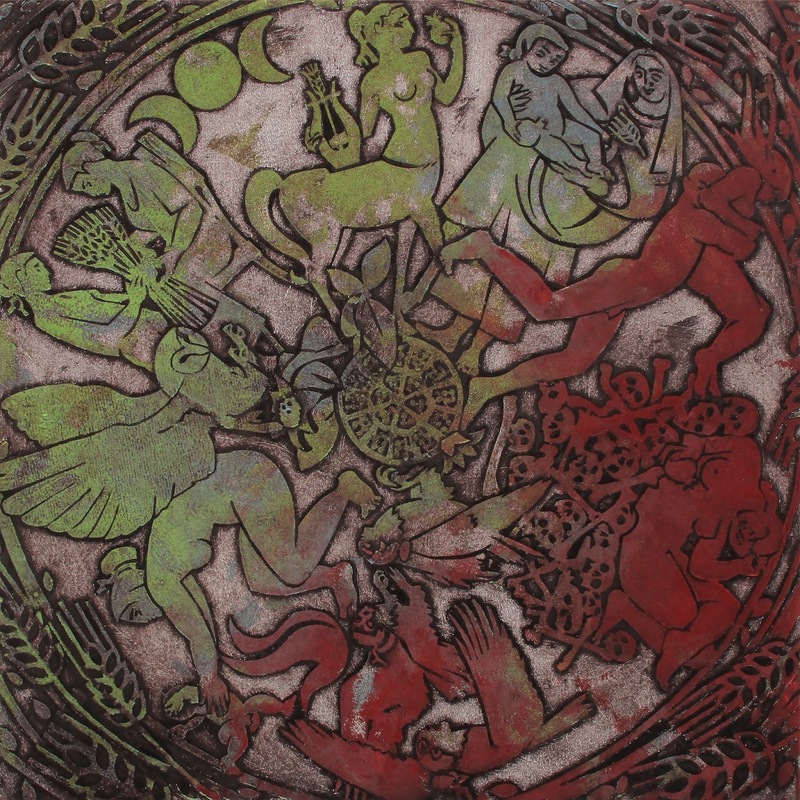 Above is my Collograph about the myth of Persephone and Demeter, named “The Persephone Cycle.” Image size, 18x18 in. It’s on display at Hinge Gallery in March, April during the Quartermaster Press Print Show: Life-Cycle and during the "Vashon Island Art Studio Tour" at Brian Fisher Studio, map #16. Persephone was the daughter of Demeter, Goddess of fertility, harvests, and perhaps the earliest version of a Great Earth Goddess except for Rhea, her own mother. Beautiful, virginal, Persephone was Demeter’s daughter by Zeus and the maternal focus of her life. Hades, Persephone’s uncle, fell in love with his young niece and decided that he would have Persephone for his bride but knew that Demeter would never approve of such an arrangement. So, Hades colluded with Zeus, her father, his brother, who agreed to a secret “union” and to his plans for Persephone’s abduction. One day Persephone was collecting flowers, when the earth suddenly opened before her and Hades rose from the crack and carried her down to his realm of the dead, beneath the Earth. Upon learning of Persephone’s disappearance, Demeter searched the Earth, asking all she met if they had seen her beloved Persephone. She even turned her daughter’s handmaidens into birds, later called the Sirens, so that they could aid her in her search. Demeter grieved for her lost daughter. Nothing else mattered but seemingly nothing else could be done. In her despair she became unconcerned with the fruitfulness of the Earth and famine, for the first time, came to mankind. Eventually Demeter rested from her search at Eleusis. Disguised as an old woman, she found a position as nurse to Triptolemus, the infant son of King Celeus and fell in love. This was a new, another, child to embrace and Demeter decided to favor him by feeding him ambrosia and each night in secret, holding the child over a fire to make him immortal. Triptolemus’s mother stumbled upon this ceremony and misunderstanding Demeter’s intentions banished the old nurse from the palace. Demeter now revealed her true identity and ordered Celeus to build a temple that she would reside in, could grieve in, while a world devoid of her attention, starved.